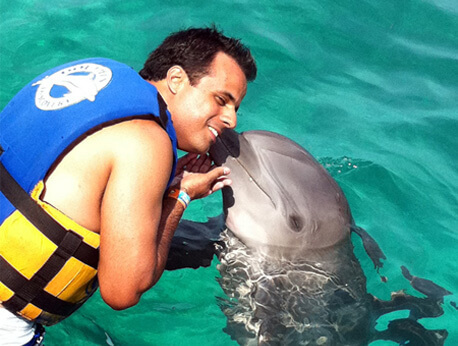 The Dolphin Swim Adventure on the Isle Mujeres, Cancun, is the perfect opportunity to swim and interact with dolphins. The tour includes a briefing from a dolphin specialist and the unique opportunity to receive hugs and kisses from dolphins. You even get to take a belly ride on these amazing marine creatures. For those on vacation in Cancun, Mexico, a wonderful way to have fun is to swim with dolphins in their natural habitat. Isla Mujeres, which is also known as the Island of Women, is the perfect place to meet dolphins. The Dolphin Swim Adventure enables you to swim and observe dolphins in the Caribbean Sea, which is a far better experience than swimming with dolphins in an aquarium setting. There is a maximum of 12 guest per tour, which allots you a more personal experience with the marine mammals. You can even take part in the Boogie Push, which is a unique experience where you will glide across the water on a boogie board while being pushed by a dolphin. For additional fun, you can partake in the Belly Ride. The Belly Ride is where you grasp a dolphin's fins as it swims backwards through the ocean. You can also shake hands with a dolphin, get a kiss from a dolphin, and more. The Dolphin Swim Adventure is offered daily. You will take a ferry ride from Cancun to the island to start your adventure. At the beginning of the tour, you will receive a 15-minute briefing from a dolphin specialist, and then you will get to enjoy 50 minutes in the water with the dolphins. When the swim is over, chances are you will be hungry, so you can enjoy an open bar and lunch buffet. If you are interested in witnessing breathtaking views of dolphins as they twirl and swim through the water, then the Dolphin Swim Adventure is perfect for you. For an additional cost, you can even get photos of your swim experience with the dolphins, which is a perfect way to share your memories with others. The Dolphin Swim Adventure is offered at a reasonable cost. For adults and those over the age of 13, the tour is only $149.00. For children who are between the ages of 6 and 12, the cost is $89.00. The cost includes lunch and ferry transportation to and from the island.